The Good Good Comedy Theatre, with its new awning, at 11th and Spring streets in Chinatown. Beginning April Fools' Day, Good Good Comedy's Five Dollar Comedy Week returns for the sixth year. There will be 30 new, original shows spanning all forms of comedy during the festival, and each will only be $5 to attend. Below are the shows Good Good Comedy is most excited to premiere this year, but there's tons more to check out, too. 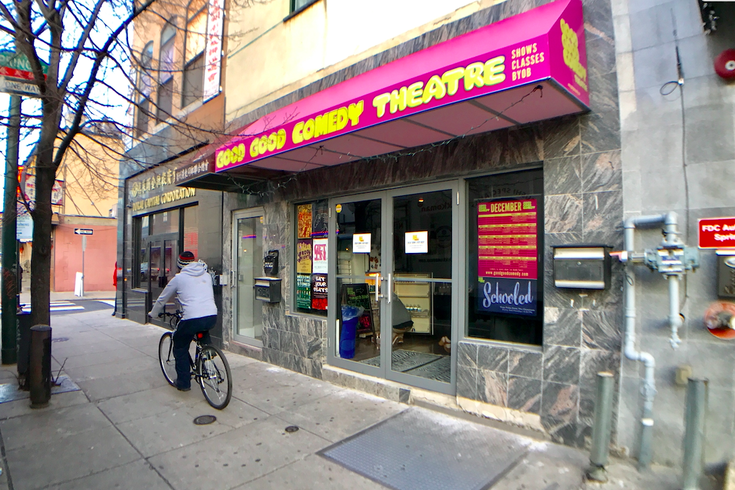 Tickets to all shows, which will take place at the Good Good Comedy Theatre in Chinatown, are currently available. RELATED: Bill Murray to perform at Academy of Music | What's the deal with Jerry Seinfeld coming to Philly? Description: "Our team of trained art authorities will transform you from a shameful dullard into a cultured expert, careening you into the spotlight of cocktail parties." Description: "Whether the show is good or not, we GUARANTEE you’ll be leaving with a bunch of free sh**, okay?" Description: "A garbage truck full of the weirdest, most experimental and unsettling burlesque performances hosted by a Trash Qween Raccoon." Description: "Set-Up is the dating game show where single non-comedians blindly choose a comedian to go on a date with based on their jokes alone." Description: "They say a news story should be like a mini skirt on a pretty woman. Long enough to cover the subject but short enough to be interesting. And this woman…is wearing pants."